If you are looking around at Herefordshire wedding venues at the moment, then congratulations on getting engaged! Finding your perfect wedding venue is going to be a really exciting quest, and celebrating your wedding day there is going to be amazing. Hopefully this blog post might help you a little bit as you look around for the best Herefordshire wedding venues. There is such a great choice of wedding venues in Herefordshire – from castles to country houses to barns to vineyards – Herefordshire really does have something for everyone who is looking for a wedding venue here. Because there are so many wedding venues in Herefordshire, I have had to narrow down my selection to just my top ten. This list is entirely based on where I love to photograph weddings, so I do recommend that you check out all the venues to make sure they suit your needs too. So, here is my best Herefordshire wedding venues selection for you…enjoy! Dewsall Court is a country house and barn wedding venue at Callow, near Herefordshire. Wedding ceremonies are possible inside and outside in a number of beautiful locations, including the church on the grounds. Mingle on the lawns for your wedding reception, or in the lounge. Your wedding breakfast can take place in the recently-restored luxury Wainhouse barn or in the conservatory at the house. Make a whole weekend of it and enjoy the luxury bedrooms. The rustic barns, gardens and the views across the Herefordshire countryside make this a really wonderful wedding venue. You can see my recently updated review of their different options for your wedding here. 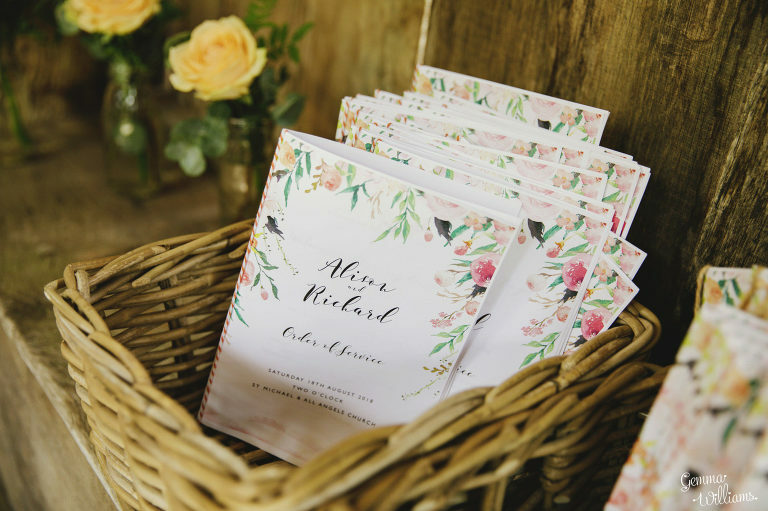 This guide takes you through your whole wedding day at Dewsall with the aid of pictures to visualise how your own celebration would look. 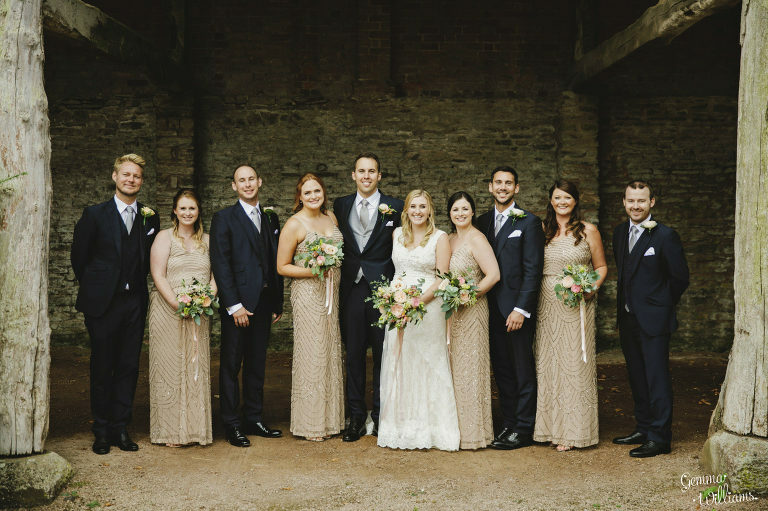 Take a look at Katherine & Ian’s wedding at Dewsall Court for more inspiration, as well as Alison & Rich’s wedding, one was outside and one in the church. 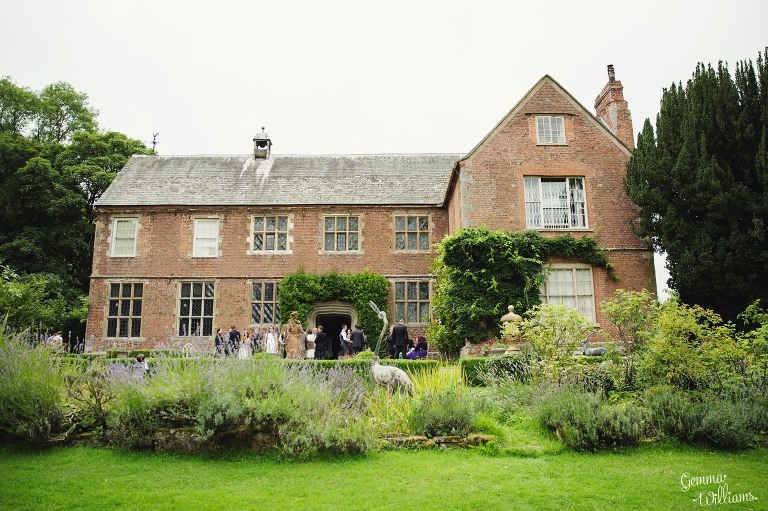 Homme House is a country house wedding venue at Much Marcle in Herefordshire. Wedding ceremonies are possible in the main house and also in the gardens by the summer house, or in the church at the edge of the estate. 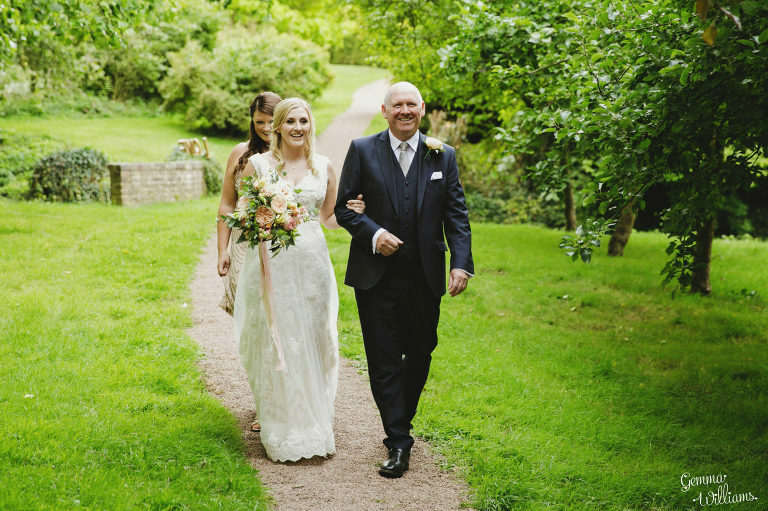 They have put a lot of work into creating beautiful grounds for your wedding photographs and for your guests to mingle in, including a rose garden, dovecot and wildflower meadow. Wedding breakfasts can be held in the dining room or in an adjoining marquee. With such a warm, welcoming and homely atmosphere, you really do feel like this house is your own home for your wedding weekend. I wrote a full review of this venue on the blog here, guiding you through a whole wedding day with the help of photographs to imagine your own wedding. Take a look at my Homme House wedding mashup for even more ideas. Hellens Manor is an ancient manor house with two barns on the grounds, located practically next door to Homme House at Much Marcle. Wedding ceremonies can be held in the manor house or in the barn. The grounds and backdrops are lovely for photographs, with many different areas to explore. Your wedding breakfast is held in the main barn, with a smaller adjacent barn housing the bar. As the sun sets across the orchards, you can look back on a really memorable wedding day here. I wrote a review of this venue on the blog here, with pictures to guide you through how a whole wedding day would look. How Caple Court in Herefordshire is a rustic venue with an elegant concert barn and beautiful gardens set over terraces by the historic house. It is possible to get married outside on the terraces, by a gazebo. You can also get married in the barn or in the church on the grounds. The terraces are wonderful for reception drinks afterwards, and the wedding breakfast and dancing takes places in the concert barn. You’re bound to have a few extra wedding guests in the shape of the resident peacocks who roam about! I wrote a review of this venue on the blog here, so that you can imagine how your own wedding day would look. 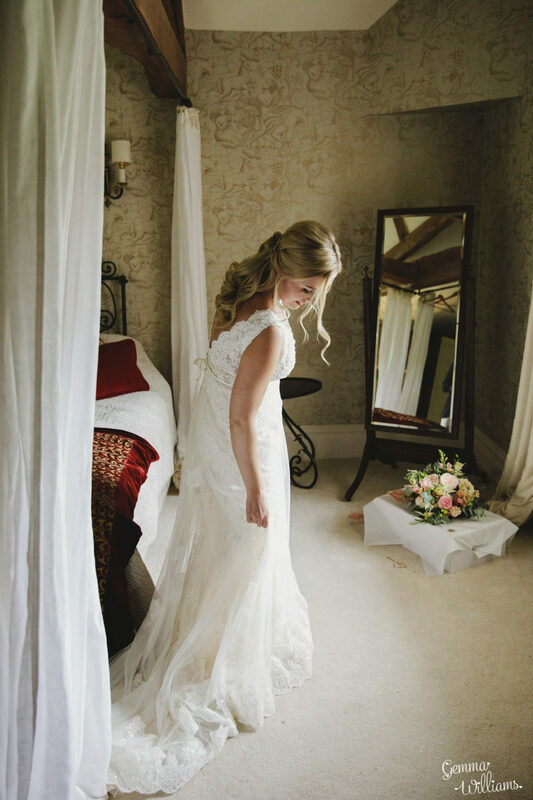 Take a look at Abbie & Darren’s wedding at How Caple Court for more ideas. Lyde Court is a rural barn wedding venue located just two miles outside Hereford. 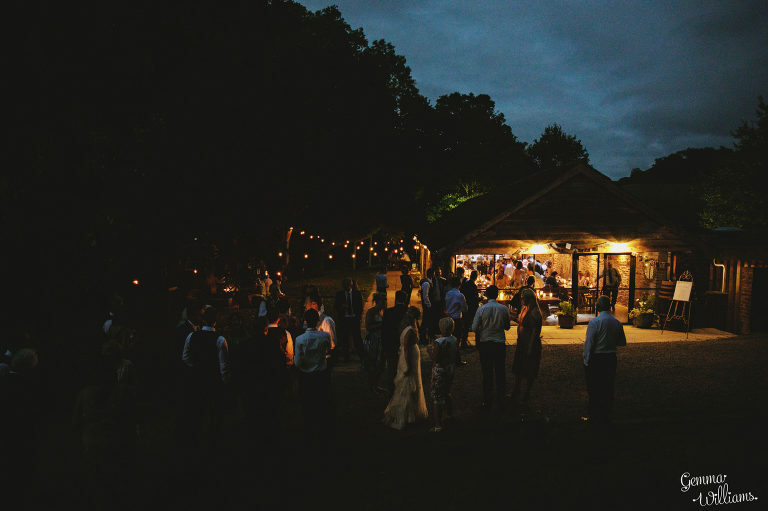 The old 17th Century stone barns are available for your wedding ceremony, wedding breakfast and evening party, providing a really atmospheric setting. You can also get married outside if wished. The venue is surrounded by amazing views over the Herefordshire countryside. This venue has so much quirky character, it really is quite unique and weddings here are always fun! I wrote a full review of this wedding venue on the blog here, taking you through each part of your Lyde Court wedding day. 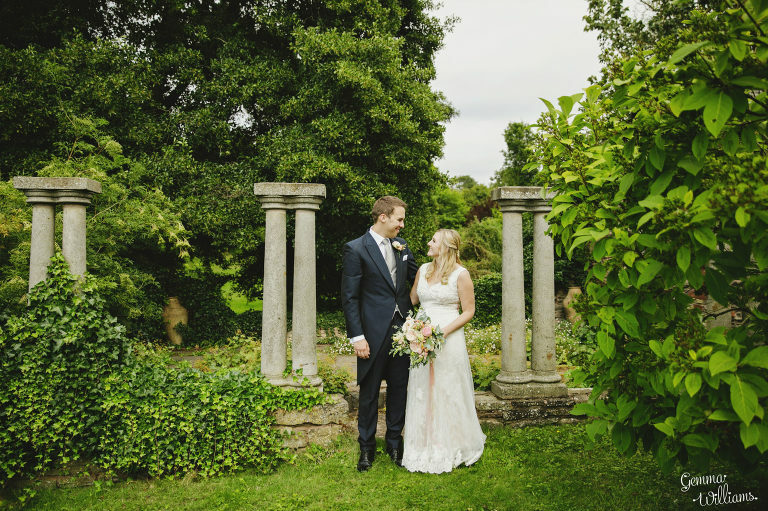 For more ideas, you can see Kerry & Matt’s wedding at Lyde Court here, and more recently Bea & Gareth’s wedding at Lyde Court here, featuring indoor and outdoor weddings. Lemore Manor is a country house wedding venue near Eardisley in Herefordshire. They have recently undergone extensive refurbishments to make Lemore a luxury wedding experience – there is now a fabulous Coach House to get married in, a Hen House for getting ready, and a stunning Orangery for your wedding breakfast. I grew up around this area so it’s always a lovely one for me to return to! Brobury House in Herefordshire is where I got married! This house has lovely gardens and overlooks the River Wye. You can get married in the conservatory, and mingle with your guests in the stunning grounds, which are perfect for photographs. 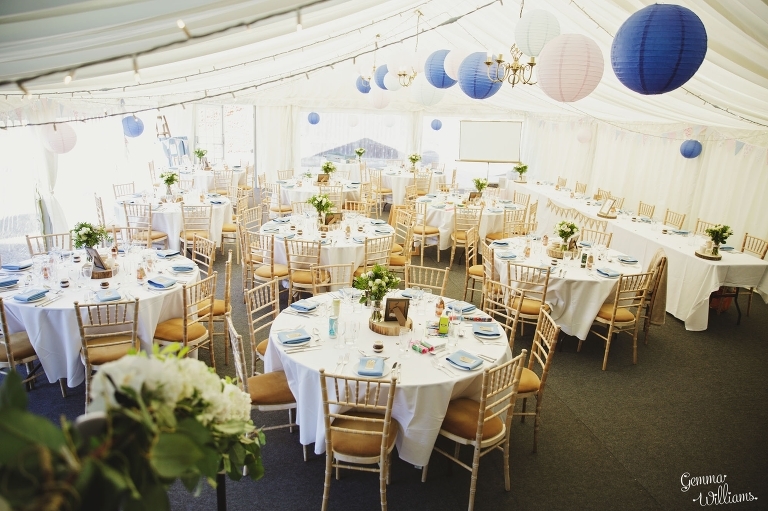 Your wedding breakfast can be held in a marquee. They only do a very small number of weddings per year so it’s a pretty exclusive venue! You can see Mel & Dan’s Brobury House wedding on the blog. Lyde Arundel is a barn wedding venue just outside Hereford, with lovely gardens and a lake by the pretty house. Wedding ceremonies can be held in the barns or outside, and then you can mingle by the lake for your wedding reception. Your wedding breakfast takes place in either a small barn or a large barn, where there are also two bars. 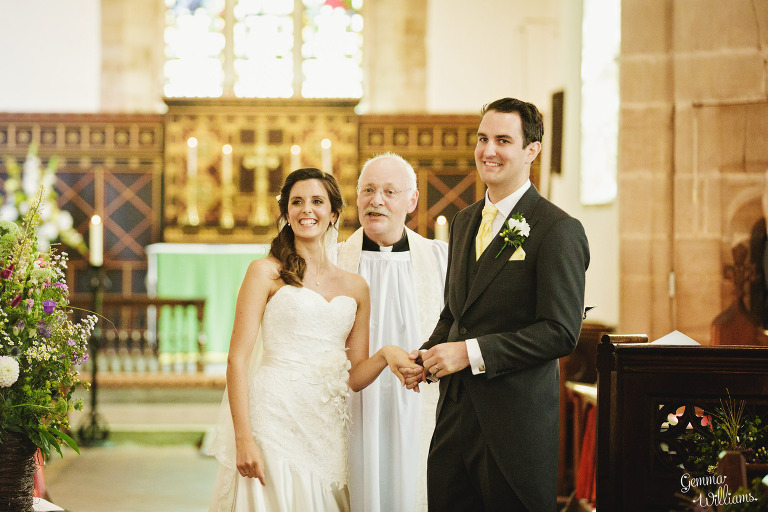 The Herefordshire countryside makes a beautiful backdrop for your photographs. You can see Emma & Adam’s recent Lyde Arundel wedding here (they were married outside by the lake). Whitney Court is an impressive country house wedding venue at Whitney-on-Wye in Herefordshire, with amazing views over the Wye Valley from the gardens. Ceremonies are held in the oak-panelled hall, and wedding breakfasts take place in the pretty dining room with views over the grounds. There’s loads of space for guests to stay overnight too. Broadfield Court is a rustic country estate at Bodenham, Herefordshire. It has recently come into new ownership, and there are lots of exciting changes happening, with weddings being started again in summer 2018. The grounds make a lovely setting for a wedding, and it’s sure to be stunning with all the new renovations inside. 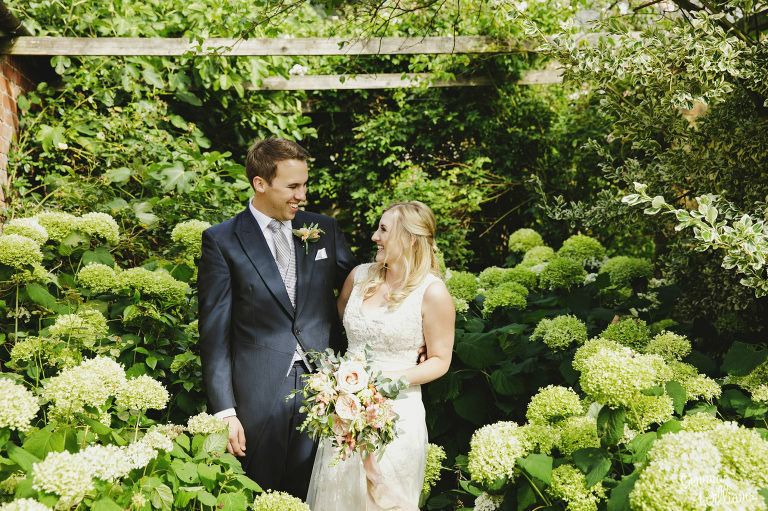 Take a look at Sarah & Tom’s Broadfield Court wedding on the blog. So that’s my run down of my best Herefordshire Wedding Venues that I love to shoot at! There are a lot more Wedding Venues in Herefordshire that I also love to go to but I had to narrow my list down to my top ten otherwise I could have rambled on for ages! I hope that this little collection has helped to expand your search for your Herefordshire Wedding Venues and maybe given you some new ideas. It’s so exciting that one day in the not too distant future you will find your favourite venue and then you can look forward to planning your wedding day there! I regularly shoot at all these lovely places, so if there is anything else I can help with in your wedding planning, please do contact me and I would be very happy to help. If you are looking around at Gloucestershire wedding venues at the moment, then big congratulations on your engagement! It is going to be really exciting to find your perfect wedding venue, and then in the not too distant future, to actually be getting married there! I am a local wedding photographer and I’ve written this blog post to help you find the best Gloucestershire wedding venue for your wedding day. These are the venues I have worked at that I love the most, so hopefully there will be some new ideas in here for you. If I can be of any further help, please let me know! Elmore Court in Gloucestershire is a magical country house wedding venue with an historic Hall and a contemporary new sustainably-built entertaining space called The Gillyflower. Being both elegant and quirky, it is an absolutely breathtaking place for a wedding. You can see Clare & Tom’s wedding at Elmore Court here. Kingscote Barn in the Costwolds is a barn wedding venue with lots of charm. The 17th Century stone barn has been beautifully restored to make a fabulous location for your celebrations. 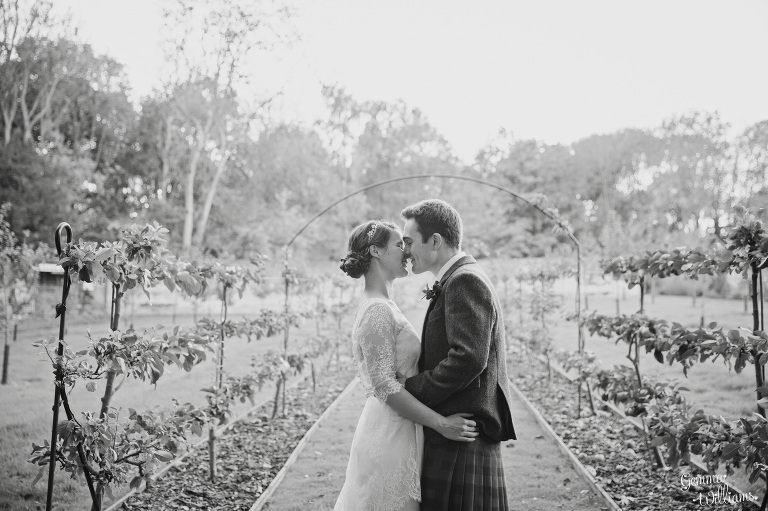 You can see Zoe & Will’s wedding at Kingscote Barn here on the blog. Cripps Barn in Gloucestershire is another amazing barn wedding venue in the Cotswolds. With it’s flagstone floors, feature fireplace and old stone walls it makes a rustic backdrop for your wedding day. Clearwell Castle in Gloucestershire is a fairytale castle wedding venue. You can get married in the castle itself, or in the church nearby. 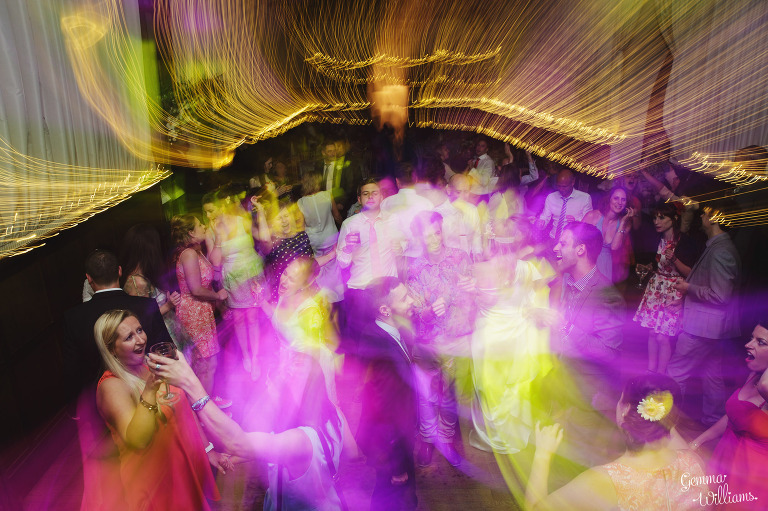 After dining in elegant surroundings in the Ballroom, you can dance the night away in the vaulted cellar. Eastington Park in Gloucestershire is a stunning country house wedding venue. Ceremonies are possible in the house, or outside in the gardens under the pretty pergola. 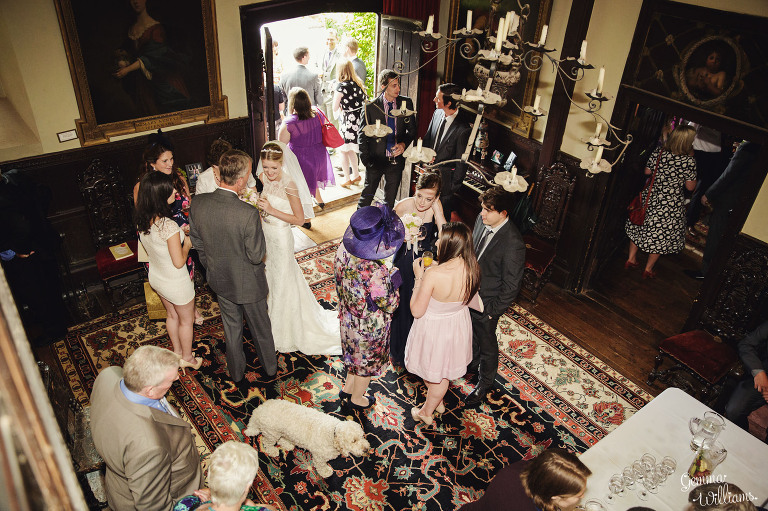 Iscoyd Park is a country house wedding venue, whose family has been there since 1843! You really do feel like the beautiful Georgian house and grounds is all yours for your wedding, due to the wonderful warm welcome you receive there and the homely feel that they have achieved with their beautiful decor. Iscoyd Park is a photographer’s dream, with everything looking absolutely perfect and making a stunning backdrop for all your wedding photographs. The friendly and experienced team of experts at Iscoyd do everything for you to make your wedding run smoothly, and they have a creative, flexible approach meaning that you can design your wedding day to be exactly as you dreamed. You can get married at the house or at the nearby picture-perfect St Mary’s Church, and enjoy a wonderful reception in the gardens before celebrating later on in the stunning purpose-built marquee garden room. This really is a very special venue and I’m sure you will fall in love with it as I have done! Walcot Hall in Shropshire is another total favourite of mine! The rustic Georgian country house set in rambling, romantic grounds is so unusually quirky and full of character, I just love it. It’s absolutely magical. From the turquoise ballroom, to the gypsy caravan and Victorian chapel in the grounds, it is such a treasure-trove of photo opportunities. The team are very flexible to accommodate all your ideas - you can get married in the nearby church, or in the house, or in the courtyard, or even in the beautiful arboretum - there are many exciting options for you to make your day unique. It has the most amazing atmosphere which will make your celebrations completely wonderful. I wrote a guide to celebrating your wedding at Walcot Hall, which you can read here on the blog. You can also see Tori & Will’s wedding day on the blog here. Davenport House has only recently opened as a wedding venue, and I was very honoured to photograph their first wedding there! It’s a beautiful Georgian country house wedding venue, which has been lovingly restored and beautifully redecorated. I definitely recommend you adding this one to your ‘must view’ list! “Step back in time for the wedding of the (last) century at Blists Hill Victorian Town! Celebrate your special day with family and friends at one of the most unusual wedding venues - a real-life Victorian Town with quirky buildings, quaint streets and countless photo opportunities. I loved shooting Sarah & Andy’s wedding here, it was so much fun to do their photographs around the Victorian streets and shops! They even had a real Victorian fairground which delighted their guests. Definitely a venue to take a look at if you’re looking for something different. The Mill Barns wedding venue in Shropshire is newly-built just for weddings and is a really impressive new barn complex! I was very lucky to be able to shoot one of their first weddings here and I would love to go back for more. This jaw-dropping new venue has been purpose-built with luxury in mind. With a striking waterfront balcony, massive vaulted ceilings, modern lighting and facilities, and set in picturesque grounds, it gives you everything you could possibly want in a wedding venue, and more. Set on the former site of a 17th Century water mill, it is now an architecturally stunning celebration barn! When I first saw it, I said ‘wow’ quite a lot - I’m sure you will too! If you are looking for Herefordshire wedding venues at the moment – congratulations! There loads of lovely wedding venues to choose from in rural Herefordshire, and as a local wedding photographer I’m really lucky to know most of them very well. So I’m writing this little guide with pictures in the hope that it might help you learn more about Hellens Manor as a possible option as you look around for your Herefordshire wedding venue. 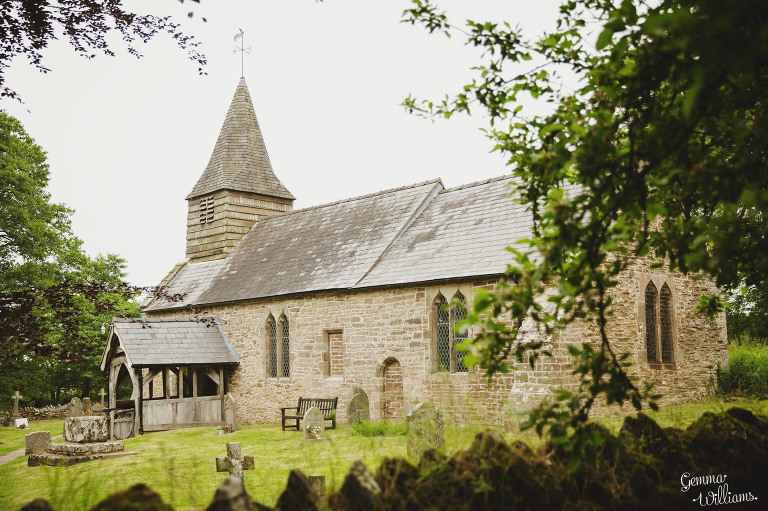 I really love Hellens – if you are getting married here and are looking for a wedding photographer, please do get in touch as I’d be delighted to photograph your wedding day! 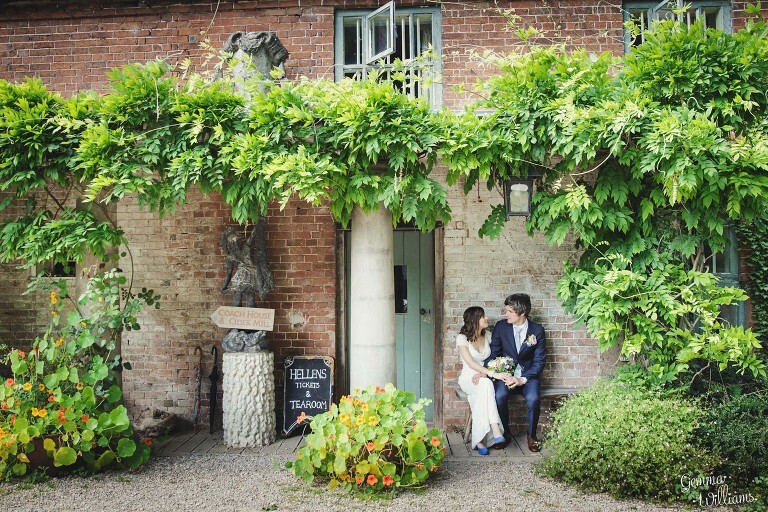 Hellens Manor and Barns is an historic manor house in Much Marcle, Herefordshire, with two barns in the grounds that are perfect for weddings. The Great Barn and the Manor House itself are both licensed for Civil Ceremonies, and the barns are a fabulous setting for your wedding reception and evening entertainment. It’s a totally unique and exclusive wedding venue, with only a small number of wedding bookings taken there per year. The gardens and grounds are wonderful – with orchards, a dovecot, a labyrinth, many contemporary sculptures, and a couple of donkeys to mention but a few features! All in all, this is a stunning setting for your wedding and there are many places for great photographs. If you would like to find out more about holding your wedding at Hellens Manor & Barns, drop them an email: info@hellensmanor.com. The Manor House is a fabulously historic building dating back to 1096, with a fascinating history and so many interesting features. You can get married in the Music Room here, which is an oak panelled room with a feature fireplace, a piano and many old books. The Great Barn at Hellens provides a more rustic setting for your wedding ceremony. With it’s beams and vaulted ceiling it is a great space for you to add your own decorations to make your wedding look how you want. It is also possible for you to get married at a church/location elsewhere and then arrive at Hellens for your reception afterwards. After your wedding ceremony, guests are invited to mingle with drinks at The Manor House while The Great Barn is made ready for your wedding breakfast. On pleasant days, it is lovely to wander in the gardens at Hellens, chatting with your friends and family. There are plenty of beautiful trees, plants and sculptures to discover. On rainy days, you can mingle inside instead, in the Hall and Music Room. These make very welcoming surroundings with the fireplace and lots of comfortable sofas. You can also wander round to the Haywain Barn and explore the orchards, play garden games and meet the donkeys. Make the most of this time in these amazing surroundings with all your loved ones! Hellens provides so many different photo spots if you would like some pictures together! It really is a photographer’s dream and I absolutely love shooting here – the rustic barn and brick backdrops, the wooden doors, archways, and old windows, the flowers and greenery, and the meadows and gates are all so perfect – this type of place suits my photography style down to the ground! I love to keep your couple photographs as natural as possible so that they reflect the real you – I like to work with you as a couple and capture the feeling of your wedding day, whether you are a romantic couple or a quirky couple or everything in between! Your wedding breakfast will take place in the Great Barn, which can seat up to 100 at round tables. This amazing space is your own blank ‘barn’ canvas to decorate however you wish. The layout is very flexible, with your top table position being possible just about anywhere! You could also have a circular top table, or a long top table, as preferred. The Haywain Barn is right opposite the Great Barn and features as the bar for your evening wedding celebrations. It’s a wonderful feeling to sit in the beautiful Herefordshire countryside, surrounded by apple trees, chatting to your friends and family, as the sun begins to set. For your first dance, the top end of the Great Barn is cleared into a dancefloor area, and you can have a DJ or a live band if wished. The lights are lowered and the dancing commences! 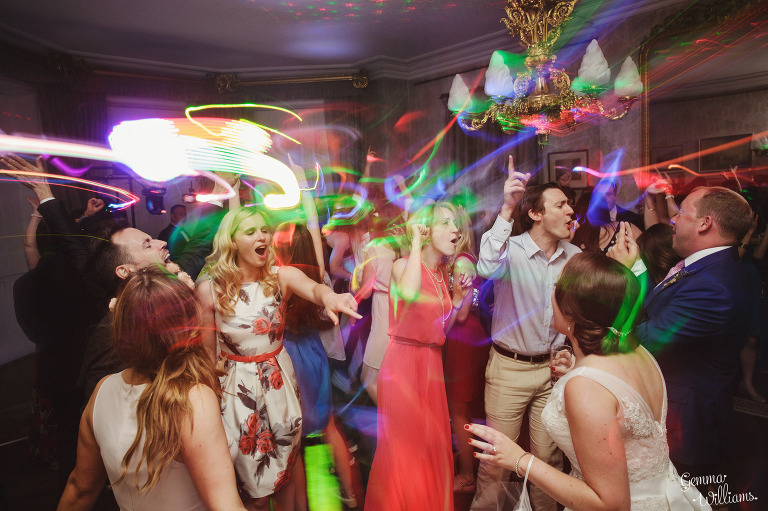 Welcome your guests onto the dancefloor to show off all their crazy moves, and party the night away at Hellens. You can also find more inspiration for your Hellens wedding on my Pinterest board here. I hope you have found this guide to weddings at Hellen’s Manor & Barns useful in your hunt for your Herefordshire wedding venue! 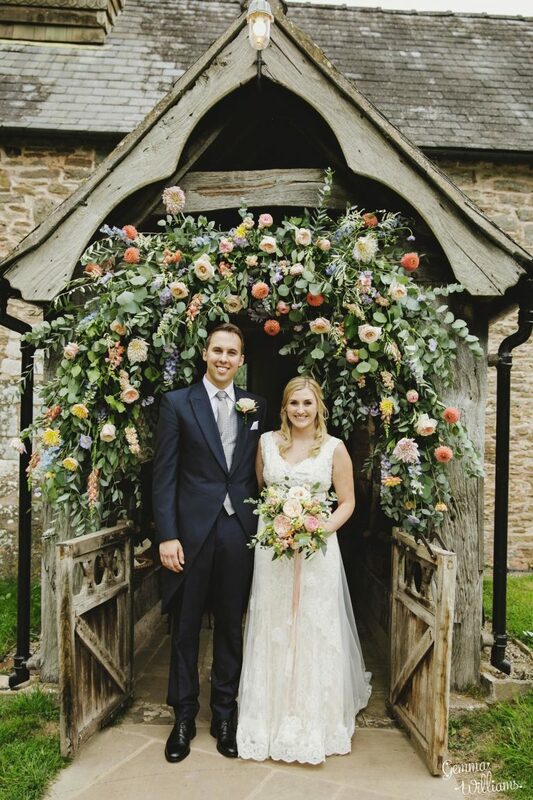 If you are looking for a Herefordshire wedding venue right now – huge congratulations! In this series of blog posts I am aiming to help you choose the best wedding venue for your wedding day. How Caple Court in Herefordshire is another of my favourite wedding venues. I am very lucky to have photographed some gorgeous weddings here over the years, and I wanted to share my knowledge of this lovely place with you to help you decide whether it’s where you want to have your wedding too! If you are looking for a wedding photographer as well, please do get in touch! How Caple Court is a beautiful country estate located in rural Herefordshire, lovingly run by the owners Vanessa & Roger Lee. The estate has an incredible history and is mentioned in the 1089 Domesday Book! The stunning gardens and the barn with adjoining marquee are available to you for your wedding day. How Caple Court is licensed to hold civil ceremonies in the Concert Barn, or outside in the romantic Gazebo in the gardens. There is also a church in the grounds for your wedding ceremony if you would prefer. Enjoy your drinks reception on the formal terraces and picturesque gardens in front of the house, before your wedding breakfast and evening’s entertainment in the barn or adjoining marquee. With stunning views across Herefordshire and the Welsh mountains, and with endless beautiful photo spots, this really is the most romantic and rustic setting for a wedding. If you are getting married at How Caple Court and you are looking for a wedding photographer, I would be delighted to chat further with you about your plans and your wedding photography! Upon arrival at How Caple Court on the morning of your wedding, you are sure to see some of their peacocks strutting about! There is even a white one – perfect for your wedding day. The bride and her bridesmaids are welcome to have the use of the stable for getting ready – it has been made into a lovely space for the girls to have their hair and makeup done together. It’s then just a short walk down the drive to where your wedding ceremony is taking place. At How Caple Court, you have a number of options for your wedding ceremony. 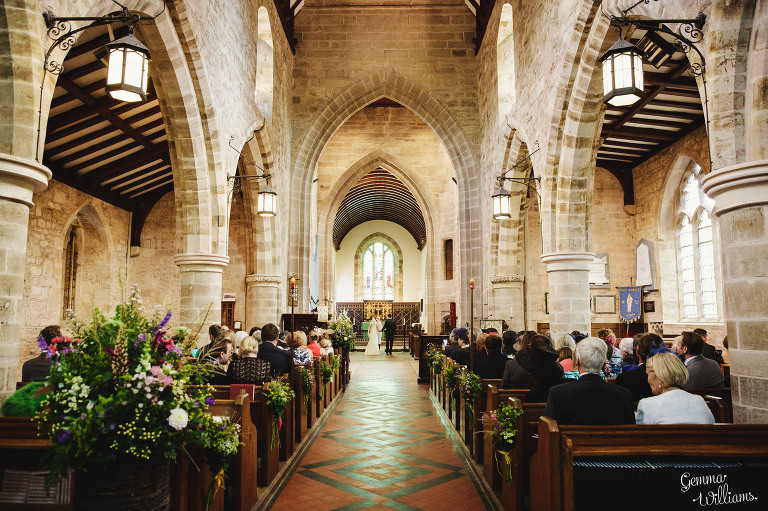 For an indoor ceremony, you can either get married in the Concert Barn, or you can get married in the 13th Century Church located in the grounds. 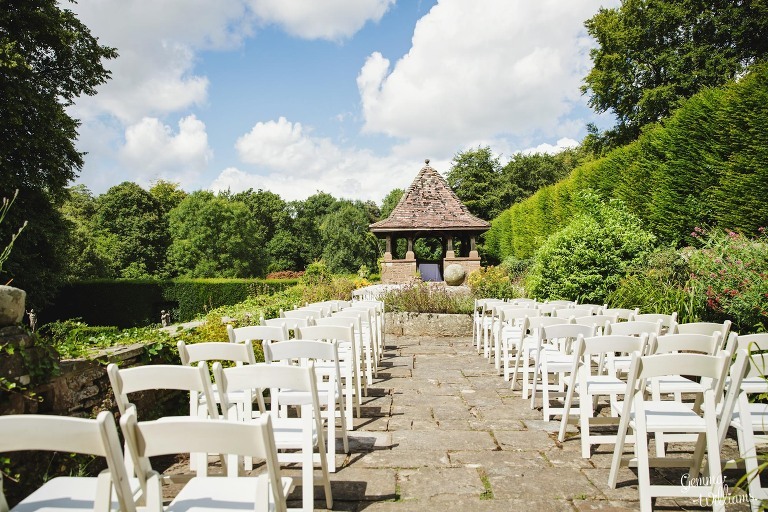 For outdoor wedding ceremonies, the romantic garden gazebo on the terraces is licensed for marriages – this is a stunning setting with views across the gardens to the Wye Valley and Welsh Mountains beyond. Alternatively, you could choose to get married at another church elsewhere and then arrive at How Caple for your reception afterwards. 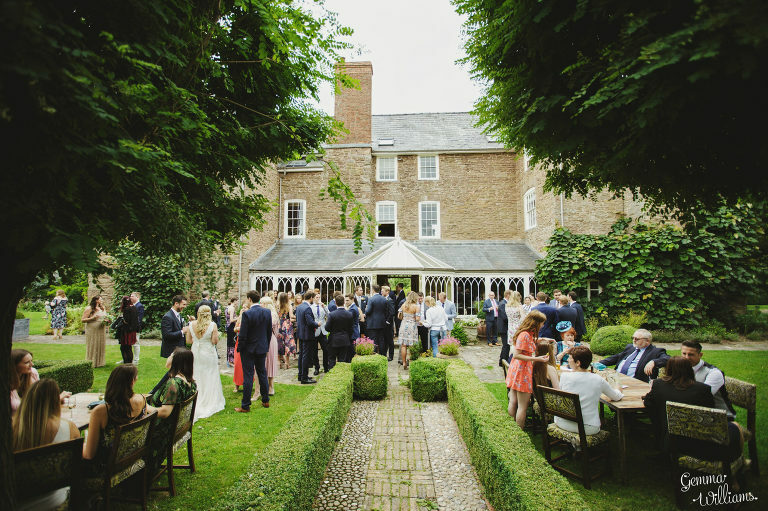 In the warmer months, the most lovely thing about How Caple Court is being able to mingle with your guests on the terraces for your wedding reception. The formal terraces date back to Edwardian times, with yew hedges, lily pools, ageing statues and a traditional rose garden, contrasting with less formal plantings of rambling flower borders, mature trees and shrubs. The rustic walls, stone stairs and charming gardens make a wonderful backdrop for lots of natural candid photographs as you meet and greet your family & friends. For the cooler months or for rainy day weddings, there is a spacious marquee adjoining the Concert Barn, where you will be able to comfortably mingle with your guests in the warm and dry! How Caple Court really is a photographer’s dream, with all the lovely places we can go for your couple photographs together. 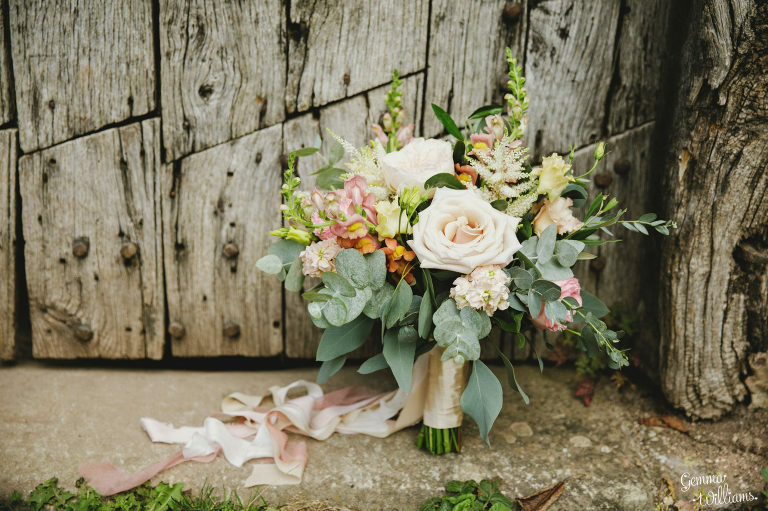 I love all the rustic details, the barn doors and stone outbuildings, the flowers and trees. 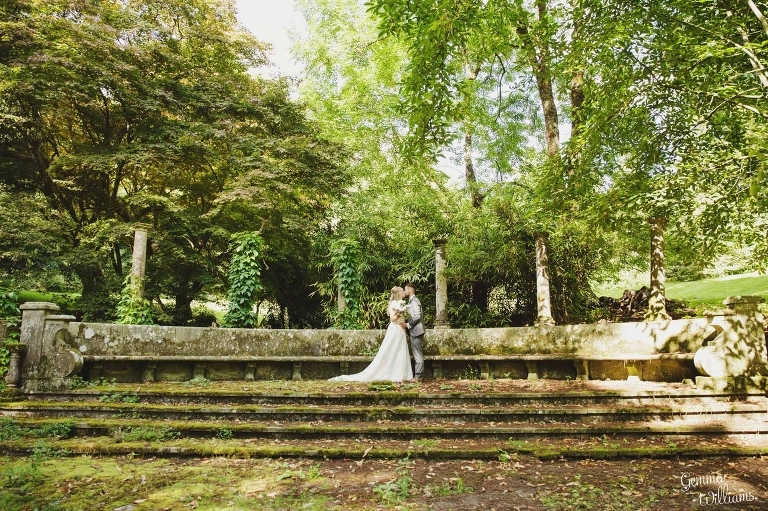 I also know a few hidden places that we can take a stroll through the grounds to find, with romantic gateways, lovely light, and an overgrown Italianate outdoor theatre in the woodland – all amazing for your photographs. It’s such a nice idea to take a few moments away from your guests and enjoy a little time with just the two of you together in the loveliest parts of your wedding venue, taking it all in. I like to shoot in as natural and relaxed a way as possible, so that you get some beautiful photographs of the two of you just being yourselves together in these atmospheric surroundings. Your wedding breakfast can take place in the oak panelled Concert Barn, or in it’s adjoining marquee. These can seat up to 120 guests, and have marquee lining, beams, fairy lights and chandeliers. You can add whatever decoration you would like to the spaces to suit your own wedding day styling. Up to 200 guests can be held for your evening party. Your band or DJ can set up on the stage area at one end of the Concert Barn. Rock your first dance and then get all your guests on the dance floor with you to party the night away! The adjoining marquee has a bar area set up where guests can also mingle and chat away from the music if they wish. Enjoy celebrating with your guests before your wedding day at How Caple comes to an end! If you are looking for wedding venues in Herefordshire, then hello and congratulations! I’m a local wedding photographer and I have shot many lovely weddings at Dewsall Court in Herefordshire, so I hope that you will find this little guide helpful if you are looking at this venue as being a possible choice for you! If you are thinking of getting married at Dewsall Court, please do get in touch, as I love shooting weddings here and I am highly recommended by the venue. You can find more information on my website – please do take a look when you’ve read my guide to Dewsall Court! Dewsall Court is located in the middle of the Herefordshire countryside at Callow, near Hereford. It is an absolute gem – the first time I ever went here, many years ago now, I was blown away by how beautiful it was (and almost changed my own wedding plans!). 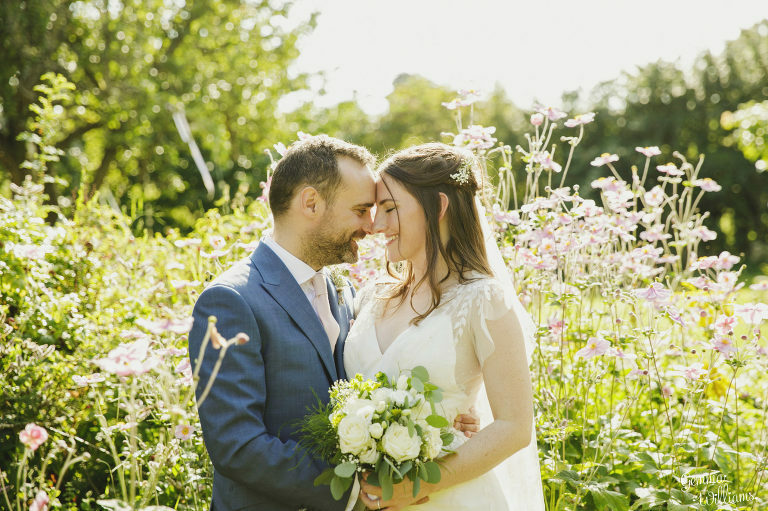 The sun was shining, the daffodils were in full bloom, and rabbits were hopping lazily about the grounds, with picturesque views of the countryside all around – really quite idyllic and a gorgeous location to get married! Samantha the owner gave me a warm welcome and showed me all the lovely rooms inside the grade II listed country house and barns, all of which is available for your exclusive use for your wedding. Each of the bedrooms is unique and spacious, beautifully decorated, all with feature bathrooms (huge baths!) and stunning views. The fabulous conservatory, kitchen, lounge and other rooms are all yours for your wedding weekend. Samantha showed me the photographs of how the house looked before the family completely renovated it – practically derelict – and the transformation to luxury is just amazing – everything has been perfectly crafted to restore the place to it’s original grandeur. Dewsall has also very recently undergone another huge transformation with the re-development and improvement of The Wainhouse. It now has fully opening glass sides, a purpose made dance floor area, a bar and all the facilities you could need. Outside, the grounds all around Dewsall are equally well looked-after, and I always love to explore the gardens and wander down to the church and the lake. The church can be used for wedding ceremonies too if wished. Dewsall pride themselves on being a totally unique wedding venue, and their flexible approach is exciting, refreshing, and different from anywhere else I have ever been. They only take a small number of weddings each year, and tailor-make every package to the couple’s requirements. 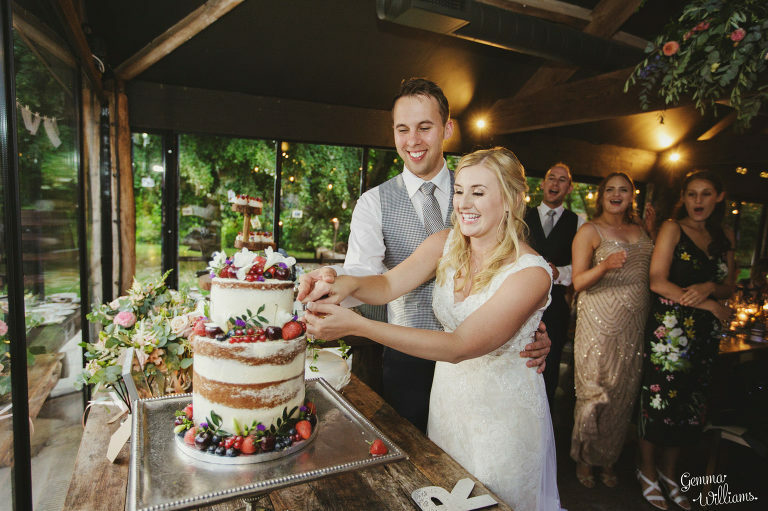 Their wedding packages include a two-night stay for you and your guests, and full exclusive use of the house and grounds – a wonderful wedding house party! Dewsall also host a number of dinner parties, retreats and courses based on country lifestyle and wellbeing, as well as paying particular attention to interesting and stylish food created from the highest-quality Herefordshire produce. Dewsall is definitely a place I love revisiting for weddings time and time again – I am head-over-heels in love with it! 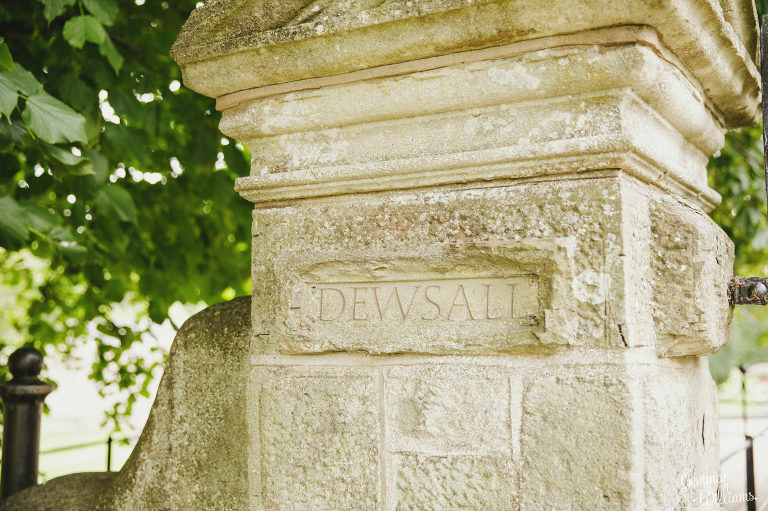 If you are interested in holding your wedding at Dewsall, there is lots of useful information on their website, and you should get in touch with them there to find out more. Dewsall has plenty of lovely rooms for all of your bridal party to stay over and get ready on the morning of the wedding. The groomsmen can also get ready in the barn rooms on site, and can even have a game of snooker in the main house. Enjoy a fun morning of being pampered by Dewsall’s recommended hair and makeup professionals, as you get ready with your bridesmaids and your family in luxury surroundings. Your Dewsall wedding planner will be on hand to make sure everything is running smoothly, and to bring you champagne if wished! When it is ceremony time, the bride can descend the Dewsall staircase and go to wherever the ceremony is taking place. The newly renovated Wainhouse Barn is a great place to hold your wedding ceremony. It now has a polished concrete floor with plenty of space for your ceremony seating, and a full wall of glass which can be opened up if it’s hot in the summer, or kept closed and cosy for winter weddings. There is also the option to have festoon/fairy lighting, and flora & fauna decorating the beams. The building is licenced for marriage ceremonies, so it is a legally binding wedding ceremony with no need to go and sign the register elsewhere before/afterwards. 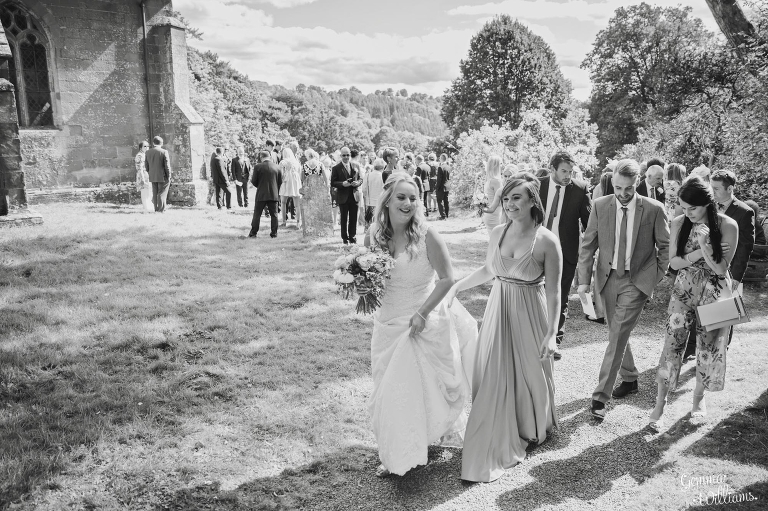 The walk to the Wainhouse from the main house is very short with a path, so access for the bride and guests is very easy, and adds to the build up of excitement and anticipation! 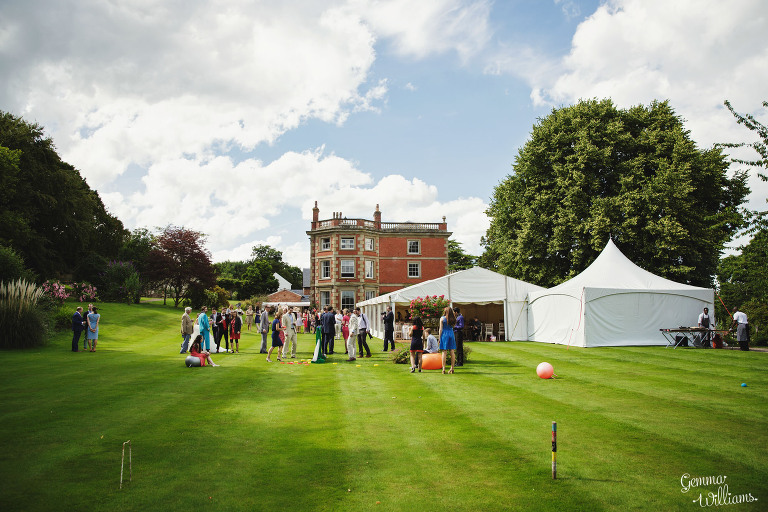 If you are having your wedding in the warmer months, it is possible to have your marriage ceremony out on the lawn at Dewsall. Outdoor weddings are becoming increasingly popular, and Dewsall is a lovely location for this, with views from the lawns out over the Herefordshire countryside beyond to the Black Mountains. You are surrounded by carefully looked-after flower borders packed with colour. Leaving the house and making your grand entrance up the aisle is a wonderful feeling for brides, and for the grooms who are eagerly awaiting your emergence! 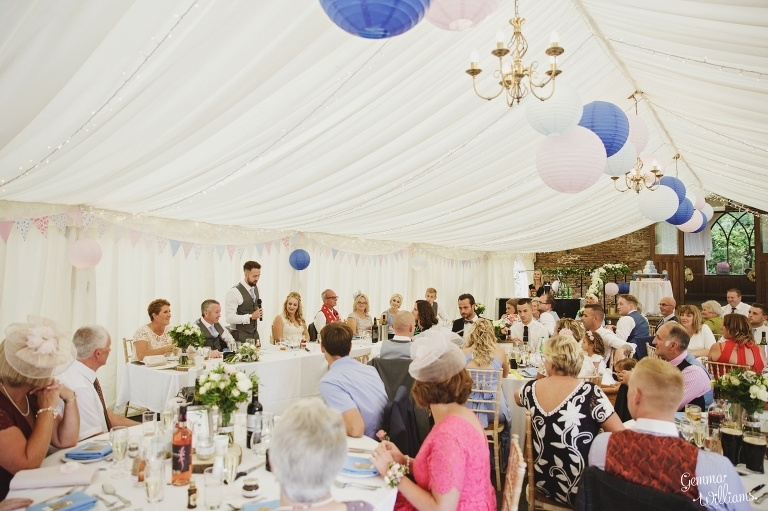 Dewsall can offer the wonderful option of a canopy if you would like to provide your guests with cover outside, whether it be from the hot sunshine or from untimely rain showers. The canopy makes a striking scene and is very rustic in appearance, made of natural wood and canvas, in keeping with the feel of the venue. You could even have it decorated with flowers if you wished. If you are not worried about the weather though, you can also have your wedding ceremony open to the skies with no canopy, enjoying the full feeling of getting married out in the open air. Outdoor ceremonies are not legally binding and therefore you would need to go inside to sign the register afterwards, or have already done this previously, to make your marriage legal, but having the ceremony outside in these beautiful surroundings makes it well worth it. Dewsall Court is very lucky to have Dewsall Church in it’s grounds. 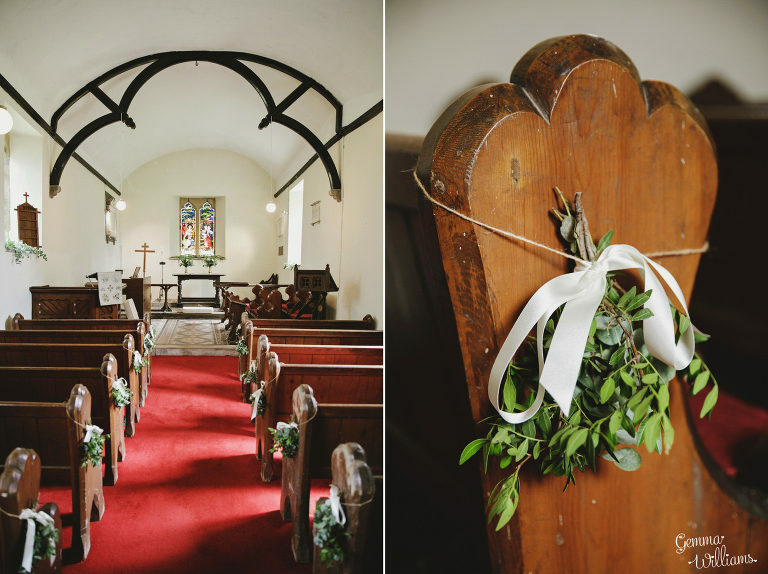 Dewsall Church is a very pretty little church with a wooden porch (perfect for a flower arch). Inside the church can seat about 80, although I have done larger weddings where people have stood at the back as well. The church wedding can either be a legally binding ceremony, or it can be a blessing (with the legal part done back up at the house or before/after the big day). 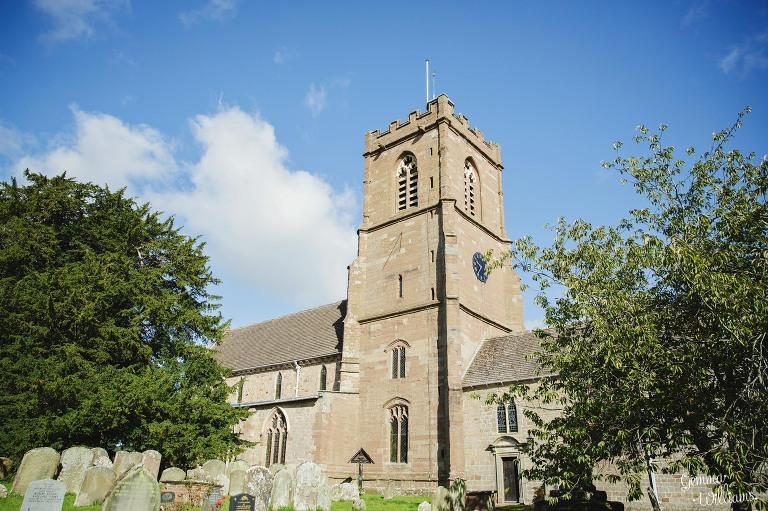 For more information about having your wedding ceremony at Dewsall Church, have a chat with your Dewsall wedding planner. If you haven’t had a legally binding location for your wedding ceremony, you can skip along to the study where you can quickly do the legal bit with the registrars to make your marriage formal! This is a nice private moment for the two of you to enjoy becoming husband and wife. During this time, your guests can be gathered together for your confetti moment outside. Confetti is pretty much compulsory at weddings I think! Luckily Dewsall allows you to throw it where-ever you like outside (biodegradable, of course), so there are lots of opportunities for your confetti moment. You might like to exit the main Dewsall front doors and have your guests waiting in two lines ready to throw it there, or you might like to exit the side or back door onto the lawns, ready for your reception there. You might even want to have it thrown along the length of the path from/to the Wainhouse, depending on the logistics of your day. Or if you have had your wedding ceremony in the church, have your guests throw confetti by the pretty wooden porch there, or along the lane on the walk back up to the main house. The choice is yours! Dewsall Court is very happy to accommodate all your wishes for your wedding day, and has lots of flexible options for your wedding reception. You have the use of the inside of the house, which is particularly useful in the autumn or winter months, or if you have a rainy wedding day. There is plenty of room in the lounge, conservatory and kitchen for your guests to mingle, and if it is cold the roaring log fires can be lit to make it extra cosy with a homely atmosphere. Outside there are the lovely grounds, lawns and gardens, with plenty of beautiful places for your guests to discover if they should wish to go exploring. In the warmer months your guests can spill out from the front of the house or from the back conservatory, and enjoy being outside in the spectacular surroundings, as drinks and canapes do the rounds. You could even have a croquet set or other garden games put out for entertainment, or have some live music playing too. 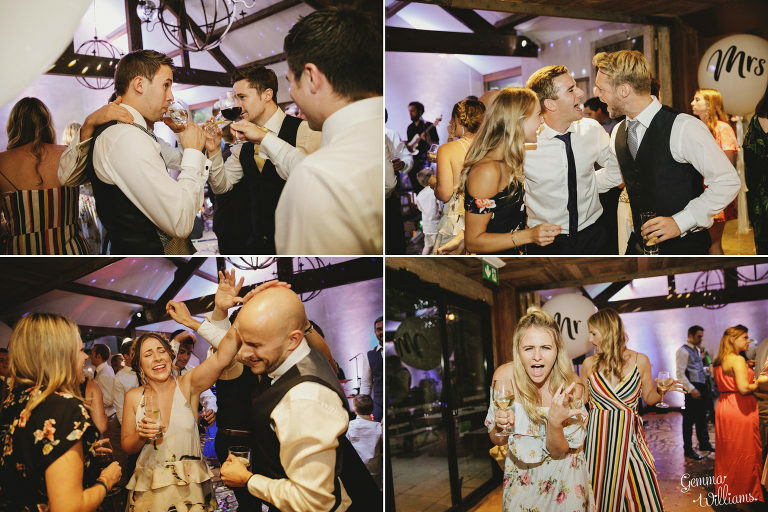 Make the most of your wedding reception time – this is the best opportunity for lots of natural photos of you and your guests chatting and laughing, as well as for any more formal photographs you may require. Dewsall Court provides a stunning backdrop for your photographs. There are lots of stone buildings, rustic barn doors, beautiful informal gardens, trees, fields and pretty views. For your couple photographs, I love to spend as much or as little time as the two of you would like, and I know all the best photo spots to take you to – the romantic hidden secret garden, the lake with willow trees and a jetty, the swing, the ivy-covered ruins, the rustic outbuildings, the spring blossom or the autumn colours, the summer meadows of long grasses, the view to the Black Mountains as the sun sets… it’s all yours to enjoy together on your wedding day. Your wedding day is flying by like a dream, and it’s time for your wedding breakfast in The Wainhouse Barn, which, as mentioned, has been newly-restored so it is now a luxury space for your celebrations, with a purpose-built dance floor area and bar as well as high-spec facilities. 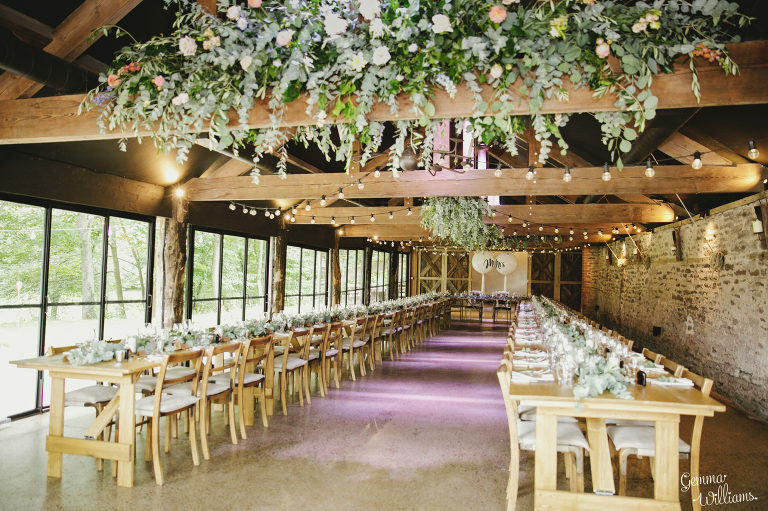 You can decorate the Wainhouse however you like, and as it already has a very rustic look of it’s own, you can really add to this with your own flower arrangements and greenery, bunting, festoon or fairy lighting, candles, lanterns, favours, furs, crockery and other touches. There are a number of ways you can arrange the tables too – with circular tables or long tables to choose from. Don’t forget that wall of glass too, which in the warmer weather can be fully opened up, so you can enjoy letting the summer in as your guests mingle inside and outside. 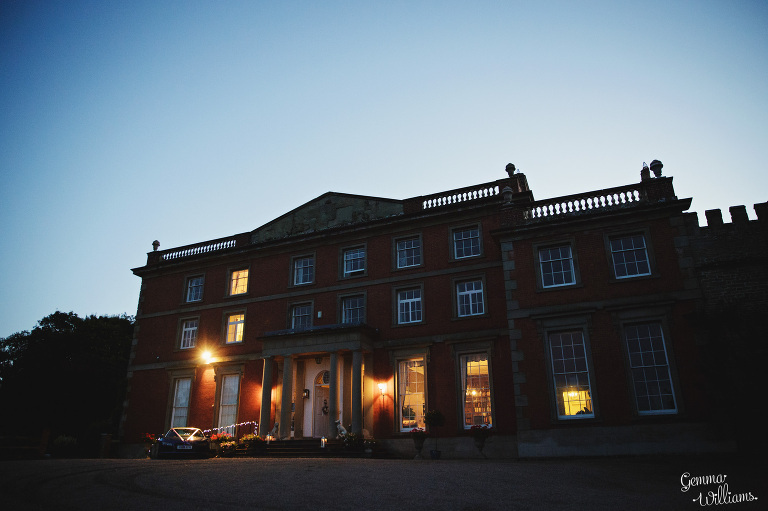 The Wainhouse can accommodate up to 120-170 guests seated for wedding breakfast, and more for the evening. Catering is provided by Dewsall’s own catering team, and is always of the highest standard (and absolutely delicious!). The Wainhouse now has it’s own dancefloor with a beautiful painted motif, and area for the band or DJ to set up without disturbing your meal. When it’s time for your first dance, the dancefloor is revealed as a surprise for your guests, as your music begins and the barn doors open to the view of you two dancing! Then all your guests can pile onto the dancefloor with you to dance the night away. With the bar close by, it’s ideal for plenty of crazy moves! There is also a firepit and seating area amongst the trees and lightbulbs outside, where guests can toast marshmallows, play with sparklers, and enjoy the incredible spectacle of your wedding day as it draws to a close. 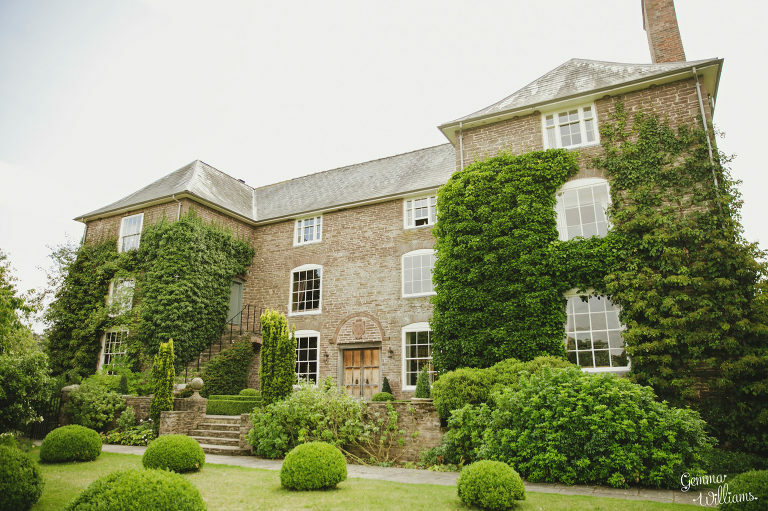 So there we have it – I hope you have found this guide and pictures of Dewsall Court helpful in your Herefordshire wedding venue search! Katherine & Ian’s Dewsall Court Wedding – ceremony in canopy on the lawn. There are also more pictures on my Dewsall Court Pinterest Board. Lots of inspiration for your Herefordshire wedding day! If you are looking around for a wedding venue at the moment, then congratulations on your engagement! Here’s a little guide from me about Walcot Hall wedding venue to help you decide if it might be the right one for you. When I first visited Walcot Hall in Shropshire near Lydbury North, I immediately fell in love with this amazing and unique place, and every time I go back, I always find new things to love about it! It is a most quirky wedding venue, with a beautiful turquoise ballroom, and grounds filled with wonderful photo opportunities. The historic Georgian country house is full of character, and the stunning countryside setting is a feast for the eyes. There is even an arboretum, a Victorian tin chapel, and a gypsy caravan in the grounds! A wonderful place for a wedding. I’m a recommended wedding photographer for Walcot Hall and I have made this guide to take you through a whole wedding day here, using pictures so that you can imagine what your own wedding day here would look like, and decide if it’s the right venue for you! 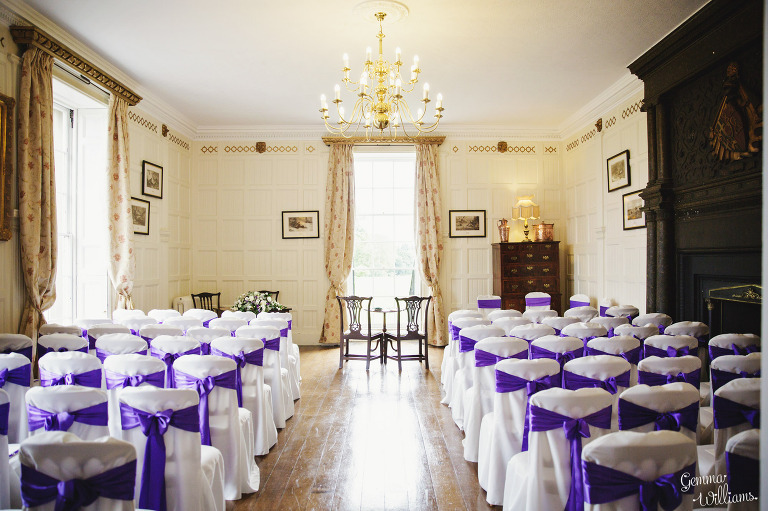 Walcot Hall has a number of options for your wedding ceremony. For indoor ceremonies, The Hall is an opulent location with pillars, paintings and that grand staircase entrance. The Hall is licensed for marriage ceremonies, so it’s a legally binding ceremony, meaning you don’t have to worry about signing the register elsewhere. The Hall also provides a useful ‘plan B’ if you are aiming to get married outside but the weather is a little uncertain. It is possible to get married in The Courtyard, just outside The Hall. (This option requires you to go and sign the register afterwards in The Hall to make your marriage legal). The ultimate outdoor ceremony option is to get married in The Arboretum, surrounded by all the beautiful shrubs and trees, with the backdrop of the feature waterfall. This space is very flexible for you to set up however you wish, with any seating arrangement. The blue summerhouse is a licensed structure, so you can go inside here for the legal signing part of the ceremony. Then have a confetti line to your reception! 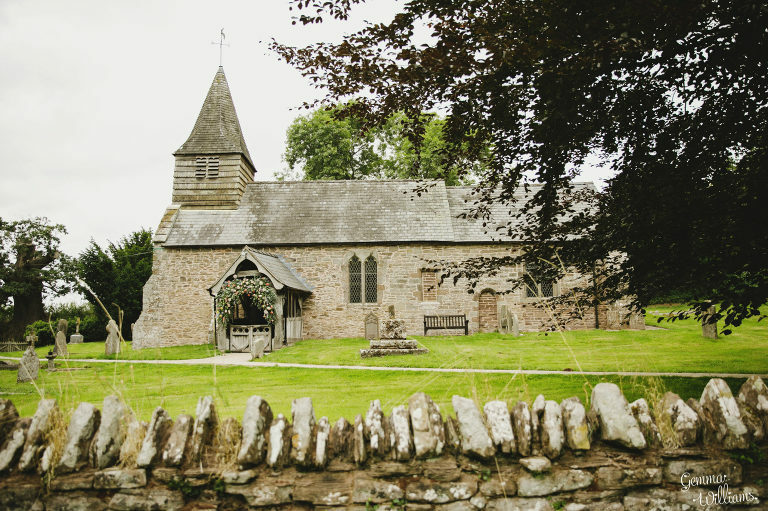 It is also possible to get married in the local church just down the road at Lydbury North, or another church of your choice, and then return to Walcot Hall for your reception. 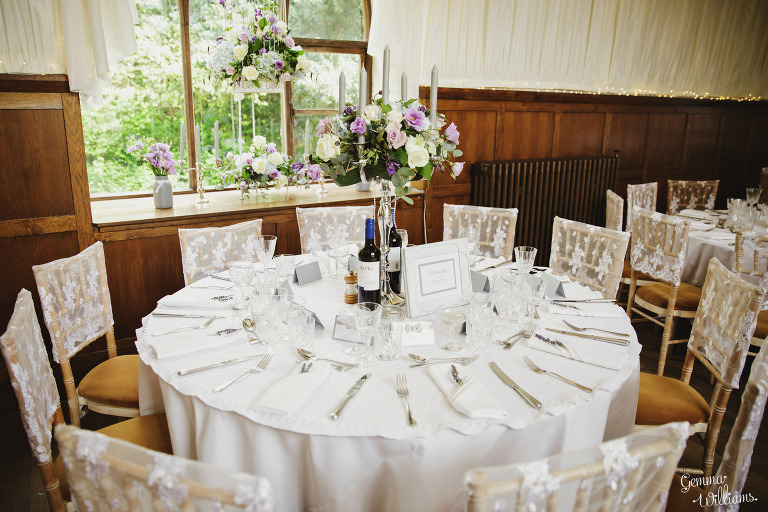 Walcot Hall has lots of lovely spaces for your wedding reception. 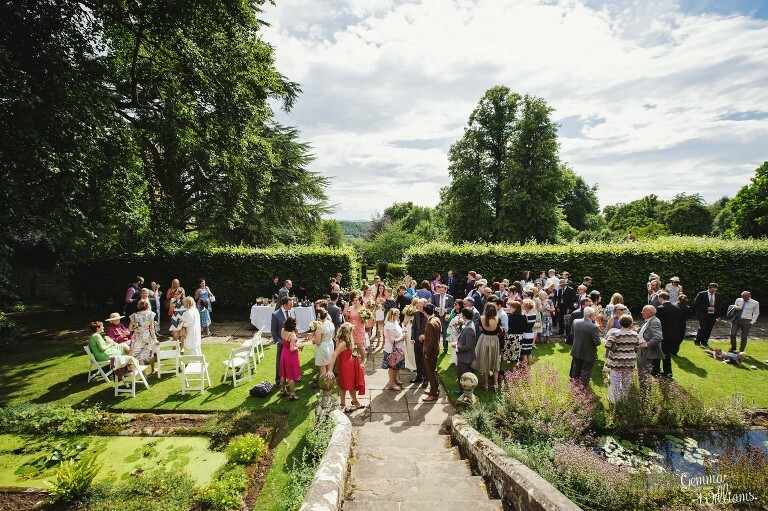 Spill out onto the lawn at the back of the house, surrounded by flowers and countryside views, with garden games, drinks and canapes, or mingle in the Courtyard amongst the ferns and contemporary statues. For rainy days, there is the Anteroom and the Hall to use. This is a great time to get lots of natural candid shots of you and your guests enjoying the day. Walcot Hall has so many amazing backdrops for your photographs, which is why I love it so much! We can spend as much or as little time as you like with just the two of you together exploring this fabulous venue. A short stroll into the woods gives lots of exciting discoveries including the Victorian tin chapel and the gypsy caravan. Close to the Hall there are walled gardens, colourful flowers, trees, and plenty of doorways, archways, and rustic brick walls. There are also the adorable summer houses and swathes of wild flowers (depending on the time of year). I like to shoot in a natural and relaxed style so that we capture real photos of the two of you just being together and enjoying this incredible day! The Ballroom at Walcot Hall is the jewel in it’s crown, being a striking room with ornate ceilings, impressive chandeliers, and turquoise walls. The team at Walcot Hall are really happy for you to create the wedding that you want to have, so you are free to arrange this space however you want, and to choose your own preferred catering option. I have seen both circular tables and long banqueting tables being used for the wedding breakfast, with the top table being placed wherever you like. 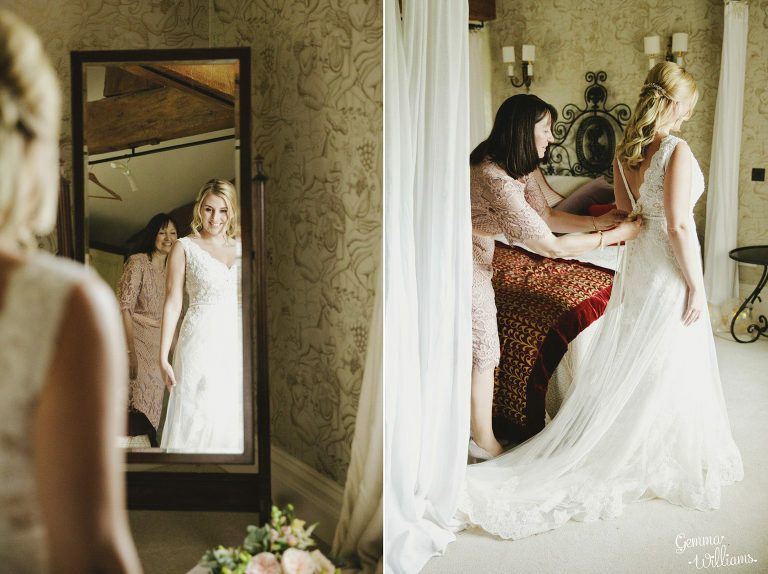 I really hope you have enjoyed my guide to a wedding day at Walcot Hall. You can also see more ideas on my Pinterest Board for Walcot Hall here.